Gone Girl is Just Okay. 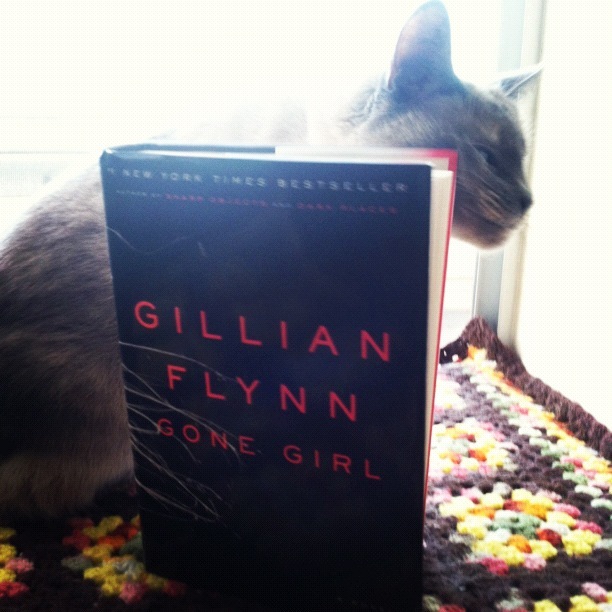 I’m just now getting around to the summer blockbuster book of this year, Gone Girl by Gillian Flynn. This is a little backwards of me, I know, seeing as I write a blog that consists largely of book reviews telling other people what to read, but when a book suddenly becomes so popular that even that one friend you’ve always secretly thought might be illiterate has read it, I loose all want to explore it for myself. It’s like all my pent-up strong-willedness comes bubbling to the surface, and I just can’t make myself read that one gotta-read book. (I still haven’t read Girl With a Dragon Tattoo for this very reason.) Often times that means that I finally read it a season or two late and then realize why everyone was so gaga about it in the first place. This instance was like that. Sort of. This book review is Cambria approved. I probably wouldn’t have picked Gone Girl up if my book club hadn’t selected it this month. Suspense isn’t usually my thing, but this one was intriguing. The female half of a seemingly idyllic couple, Amy, disappears on the morning of their fifth anniversary. With a messy scene left at the house, the police start investigating the abduction and possibly homicide. As the evidence starts rolling in, all signs point to Nick, Amy’s bar-owning, ex-journalist husband. Cleaned-up blood, his lack of emotion, their marital and money problems, and a bombshell secret make it seem like Nick is a man with something to hide. But as Nick lawyers up and both his family and the public turn against him, something still seems off. What really happened to Amy Elliot Dune? Did Nick kill her, or is there a much more sinister force at work? Let’s start with the good. Gillian Flynn is an incredibly gifted writer. Although I don’t think she fully understands the meaning of the word poignant (How does one smell or look poignant? ), her prose is expertly dealt out and she captures the voice of her various characters well. In addition, the plot is well delivered, fast paced but never rushed, and I like the way she organized the chapters, flipping back and forth between Nick and Amy’s perspectives, and using diary entries to catch the reader up on the couple’s background. I like the little clues that she left the reader in the first section that later made much more sense in the second and third. This was, overall, a creative and original offering on Ms Flynn’s part. Now for the bad. It’s rare for me to be engrossed in a book that I don’t end up liking, but that’s exactly what happened here. All of her characters- from Nick and Amy to their families and the police- were singularly unlikable. Sure, I understood them. I understood why Nick cheated, why her parents turned on him, why the Ozark rednecks were thieves, why Amy (to a point) was like she was. But I couldn’t like any of them, even in the beginning before I knew Nick’s secret and when Amy was supposed to be likable. The only one I really liked was Nick’s mom, and she is a periphery character. I’m not some modern Pollyanna who only enjoys books full of sunshine; I enjoy Sherlock Holmes and Agatha Christie and my fair share of drama and true crime and human messiness. But while I was enthralled, like a train wreck you can’t look away from, I can’t say I enjoyed this book. I felt about it the same way I feel about Ernest Hemingway, or certain movies like Mr. Holland’s Opus- I can appreciate the craftmanship, but it left me felling a bit hollow. Also, I didn’t like all the cursing. I’m not a prude by any means, I know curse words exist and I’m not opposed to them in literature if they serve a purpose. They could have served a purpose here, but I think they were overplayed- a few too many f-bombs dropped, and suddenly no one cares about the damage anymore, they just want the noise and shrapnel to stop. And I never ever, for any reason at all, approve of the c— word. Ever. If offends me down to my very marrow. It’s almost worse when it’s uttered or written by a woman. I know someone out there will think it’s empowering or very feminist, but it’s almost like a betrayal; even if it’s not true, every use of that word by a woman feels like some sort of collusion with the misogynist of the world, like a small admittance that maybe women aren’t really worth more than that. The argument could be made that it’s usage here fits the profile of the characters, but I feel like any usage in any context says it’s okay in other contexts. I just…no. You can’t convince me it is ever okay. So there you have it. Gone Girl is not bad, but it’s not dazzling. It earns a solid three-out-of-five stars from me.